Last week, Life Pilot shared a weird insight into their lives in their videoclip for Dark, Dark, Goose - with the eternal debate of whose turn it is to take out the bins being discussed, with things only getting weirder from there. In fact, their clip inspired the #lifepilotbinselfie hashtag, with people sharing themselves taking the bins out. 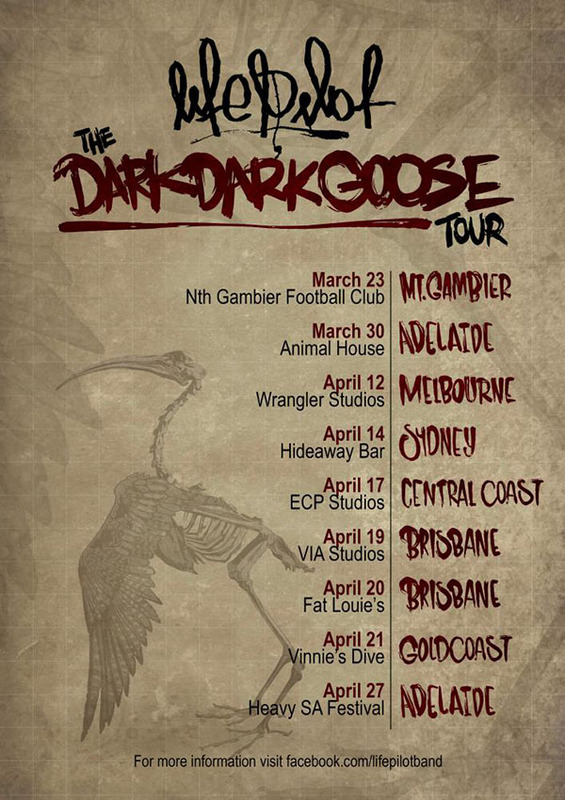 Go on, put ya bins out for Life Pilot - because they are heading around Australia on their Dark, Dark, Goose tour! They just supported Converge in Adelaide - and tore up the venue with their frenetic and chaotic show. Vocalist Angus Long says that Dark Dark Goose "is essentially about letting the opinion or expectation(s) of others toward yourself cloud your thoughts and feelings to the point of losing your own. To only then wake up one day and realise the majority of the negative commentary is really quite untrue and unfounded to begin with. It's about losing one's ‘sanity’ if you will, and the journey of finding it once again in a world full of unrealistic expectations. The line ‘Stay home Jack’ is simply finding yourself (home) and making sure you stay there (sane)." Life Pilot has toured Australia multiple times in support of their numerous releases, sharing the stage with many legendary artists along the way. Every Time I Die, HELL YEAH, Norma Jean, Senses Fail, Kverletak & More, as well as performing at Soundwave Festival and showcasing at BIGSOUND. Life Pilot's new single Dark, Dark, Goose is available now from Spotify, Apple Music and Bandcamp and ticket info is available from the band's Facebook page.